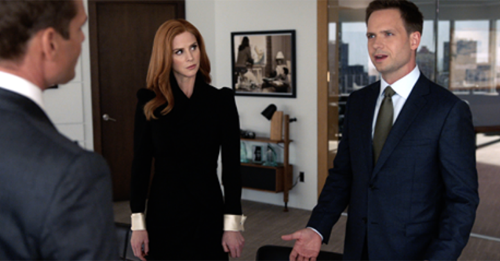 So make sure to tune in between 9 PM – 10 PM ET for our Suits recap. While you wait for our recap make sure to check out our Suits spoilers, videos, news, photos and more, right here! Tonight’s Suits recap begins now – Refresh Page often to get the most current updates! Louis is in a therapy session. He finally faces the fact that he needs to end it with Shela. Meanwhile, Mike comes face to face outside with the judge who treated him fairly during his trial. She needs to talk to him. She needs him to represent her. She is accused of overturning a verdict in the favor of a company she has an interest in. Sheila’s fiancé comes to see Louis at the office. He tells him to stop visiting Sheila. He tells Louis that he is better than him and they both know it. Sheila picked him so he needs to back off. Mike tells Harvey about the judge. Donna runs into the owner of their building outside. David Fox needs to raise their security deposit now that Jessica’s name is off the wall. Donna assures him that they are stronger than ever. He tells her to put that in writing and come visit him. Maybe he can keep their board of directors at bay. Donna smiles and accepts his invitation. Mike and Harvey are at the batting cages. After hitting a few balls they both realize that there is an upcoming trial that someone wants the judge off of. If she can recuse herself then she wouldn’t be benched for 6 months. They go to see the judge. She turns their solution down. She isn’t going to back down from any trials because they are threatening to ruin her reputation. She didn’t do anything wrong. Donna brings the letter to David. He thanks her and hands her a 90-day letter for the termination of their lease. Donna asks him why he is doing this. He admits that their lease payments are below market. He chose her because she is new to her position as COO. He figured he would take advantage. She can keep their conversation to herself and just pay the increase. Donna refuses. She runs to Rachel and tells her she needs help a Harvey doesn’t need to know. Harvey and Mike eat and drink at a local bar. Mike lets Harvey tell him about Paula and Donna. Mike admits he was the one who urged Donna to tell Harvey about her feelings. Harvey doesn’t blame Mike, but it makes him think. Maybe they can trick the two businessmen going after their judge to admit they fabricated the allegations against her. Louis is up against Zander in a case. They go back and forth with one another. Louis heads to a therapy appointment after where he confesses that he wants to tell Zander everything. His therapist tells him that if he does that they need to stop seeing one another. He has mentored Louis to do the right thing and he cannot be apart of people hurting one another on purpose. Donna brings David a suit that has been filed against him. He laughs. Now that she has filed a suit he can evict them within 30 days, as per the clause in their contract. Harvey and Mike pay a visit to the parties who are trying to damage the judge’s reputation. She tells them that this isn’t the judge’s first mistake. She crossed the line 12 years ago. They head to see her. She admits she did wrong. The trial was about a young kid who had a moron public defendant. Donna tells Rachel that David is evicting them. Mike comes to Harvey after doing some research on the judge’s case from 12 years ago. Harvey wants to drop the case now, but Mike wants to help the judge who helped him after she admitted to them that she was asked to approve a wiretapping of their office phones during Mike’s case. She refused. Trina brings Louis all he needs to take Zander down in court. Louis wants to offer him a settlement. He doesn’t want to embarrass him. The next day he brings Zander what he has. Zander taunts him about how he may be the better lawyer, but he has Sheila. Louis bites his tongue. Harvey comes to see Mike. They apologize to one another. Meanwhile, Sheila comes to see Louis. She asks him to drop the case against Zander’s client so he can save face. Rachel agrees to pull an all-nighter one more time to figure out how to take down David without Harvey’s help. Harvey tells Louis about the judge’s case. Louis gives him the history and the insight he needs to make the parties on a witch hunt to back off. Meanwhile, Louis tells Harvey his problems with Sheila. Harvey tells him to do what he thinks is right. Donna and Rachel pay David a visit. They bought all of the air rights in front of his beautiful buildings. They plan on outing gigantic Tampon ads there. He backs down and agrees to take 10% off their lease. Harvey and Donna share a drink at the end of the night like old times. Louis arrives home to find Sheila. She left Zander. She loves him.